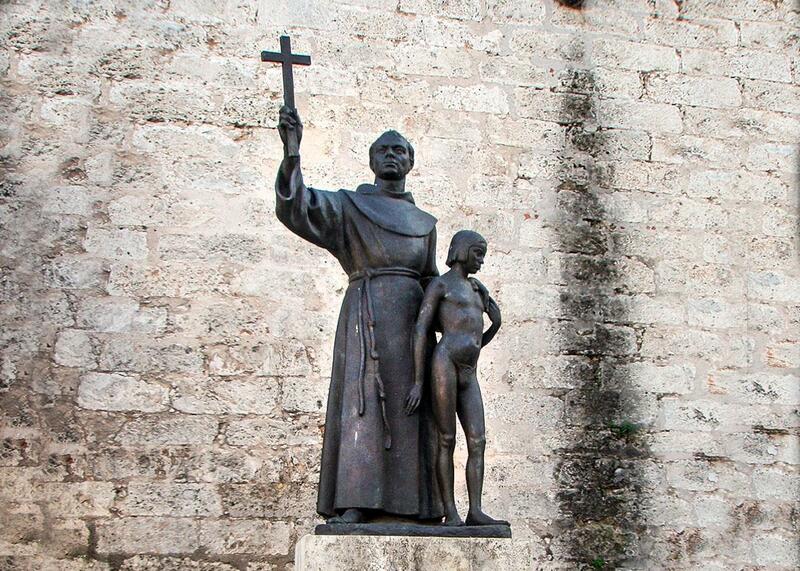 Junipero Serra: Why is the pope of the poor canonizing a Spanish colonialist? Why Is the Pope of the Poor Canonizing a Spanish Colonialist? Monument to Junípero Serra, with a Juaneño Indian boy, in the plaza de San Francisco de Asis in Havana, Cuba, January 2008. This afternoon, Pope Francis will perform the first ever canonization on U.S. soil, when he makes 18th century Spanish missionary Junipero Serra a saint in a ceremony at the National Shrine of the Immaculate Conception in Washington D.C.
Serra’s defenders say he shouldn’t be assessed by 21st century standards, and that his attitudes were enlightened for their time—he critiqued the Spanish military for its harsh treatment of Native Americans. “Time and again, Serra insisted the Spanish were not in California for gold or land, but the good of the indigenous people,” biographer Gregory Orfalea recently wrote in the L.A. Times. Some have suggested Francis may feel a kinship with Serra, who left a cushy academic position in Spain for a remote and often grueling posting, but the canonization seems odd from a pope who has made a point of apologizing for the church’s “”many grave sins” against indigenous peoples. He’s widely expected to address this dark history during the canonization today, but for many descendants of those Serra was sent to convert it will ring pretty hollow.